recognitions related to sales that occurred prior to 2018. Adjusted free cash flow was ($44) million. authorization at an average price of $28.62. to reflect fourth quarter 2018 share repurchases. Net income is projected to be between $260 million and $275 million. Contract sales are projected to increase 9.0 to 11.0 percent. year ended Dec. 31, 2017.
one-time re-measurement of net deferred income taxes under the new U.S.
federal income tax rate provided by the Tax Cuts and Jobs Act of 2017.
of 2018 when construction of that project was completed. to $1.4 billion compared to the year ended Dec. 31, 2017.
an increase of 7.5 percent compared to the prior year. Dec. 31, 2018, from 743 for the year ended Dec. 31, 2017.
customers who financed part of their purchase. percent as of Dec. 31, 2017.
to $204 million and 55.6 percent, respectively, for the year ended Dec.
million for the quarter ended Dec. 31, 2017.
construction of that phase of the project was completed. deferred income tax benefit of $132 million. 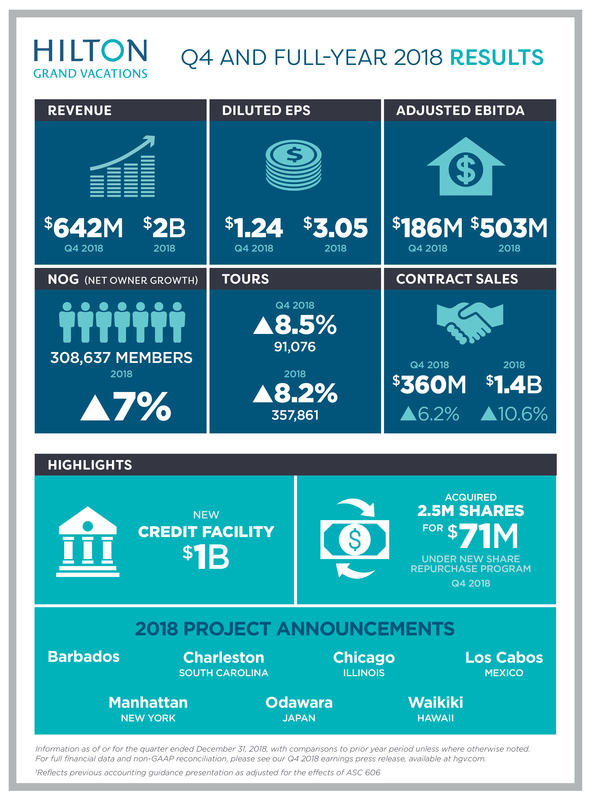 6.2 percent to $360 million compared to the quarter ended Dec. 31, 2017.
to 91,076 and VPG decreased 2.0 percent to $3,775. an increase of 7.9 percent compared to the quarter ended Dec. 31, 2017. $66 million and 55.9 percent, respectively, for the quarter ended Dec.
the quarter ended Dec. 31, 2017. Owned inventory represents 76 percent of HGV’s total pipeline. Fee-for-service inventory represents 24 percent of HGV’s total pipeline. inventory represents 56 percent of HGV’s total pipeline. including $72 million of restricted cash. average interest rate of 3.1 percent. million in the prior period. was $684 million of available capacity on the revolver. trades or other transactions subject to customary restrictions. resort-style campus comprised of a dozen one- to four-story buildings. quarter of 2018 when construction was completed on this project. second quarter of 2018 when construction was completed on this project. was no net financial impact in 2018.
were reversed with a cumulative adjustment to retained earnings. quarter ended Dec. 31, 2018. Ocean Tower that have no full-year financial impact. ASC 606 and ASC 605 based on percentage of completion. guidance to previous accounting guidance. under ASC 606 and the $435 million as reported under ASC 605.
marketing, brand and other fees rather than as amortization expense. Investor Relations website within 24 hours after the live event. A telephone replay will be available for seven days following the call. +1-719-457-0820 internationally and use conference ID# 7540297.
available to management at the time HGV makes such statements.